Free • Part of programming for Plastic Fantastic? At PechaKucha Night creative people share ideas and current projects through six-minute presentations. In this special Plastic Fantastic? 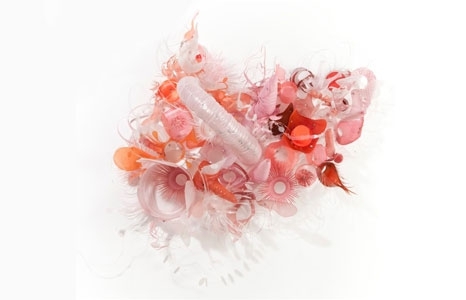 edition, artists, designers, and professionals share work that relates to the many issues surrounding plastic. Plus it’s a rare chance to experience Spalding House at night! • Julia Cornell, HoMA teaching artist for Plastic Fantastic? The event is free, but because seating is limited, reservations are a must. To book a spot, please email: eventrsvp@honolulumuseum.org, put "PechaKucha Plastic" in the subject line. Guests are encouraged to use our free shuttle service from the Honolulu Museum of Art School parking lot, located at 1111 Victoria Street, with entrances on Beretania and Young Streets. You can park in the lot for free. Stalls at Spalding House are limited, and street parking is not permitted. • Mat. You'll be sitting on the lawn outside the Spalding House Cafe. Some mats will be provided. Bring your own for a guaranteed seat! • Water bottle—we want our events to have as small a waste footprint as possible, so bring your own water bottle if you can. There will be two water dispensers.